The winter of 2016-17 was quite a turn from the past several winters for parts of the U.S. For others it was more of the same. One of the big differences this winter occurred in the West, where it was colder and for the most part snowier than normal. The big winner for snowfall was the Sierra Nevada Range in California where they have not seen totals like this in a long, long time. It was wonderful news for a region that had been in one of the worst droughts on record. In fact, the extended period of moderate to heavy precipitation events that occurred across California enabled them to almost completely erase the drought, something many scientists thought was not possible over such a short period of time. For much of the rest of the nation, meteorological winter (December through February) was not only mild, but also produced relatively meager snowfall. I like to begin my assessment of meteorological winter with a review of the statewide average temperatures across the U.S. and how they ranked historically. 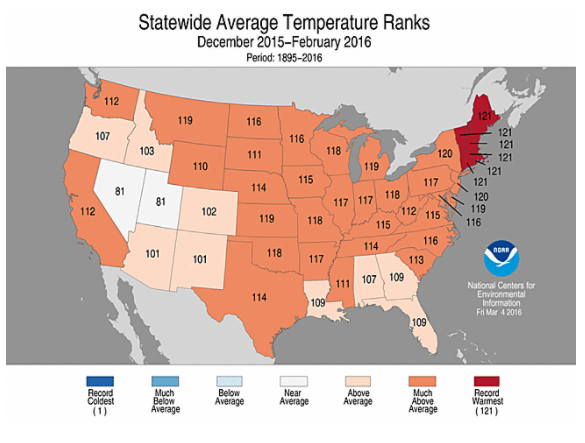 As you can see, this past season much of the U.S. east of the Rockies was within the Top 3 to Top 5 warmest winters on record. 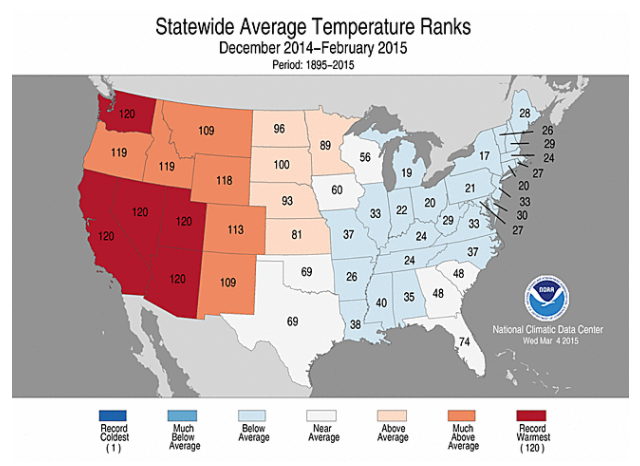 In contrast, The Pacific Northwest saw one of its colder winters on record. Below this season’s rankings are those for winter 2015-16 as a comparison. The biggest difference across the U.S. was the Pacific Northwest where one of the warmest winters on record was replaced by much colder conditions this year. I also include the stats from the 2014-15 season because it stands in such stark contrast to this past winter. On a national scale, from the perspective of seasonal snowfall, the Sierra Nevada Range in California was “hands down” the winner for snowfall this year. 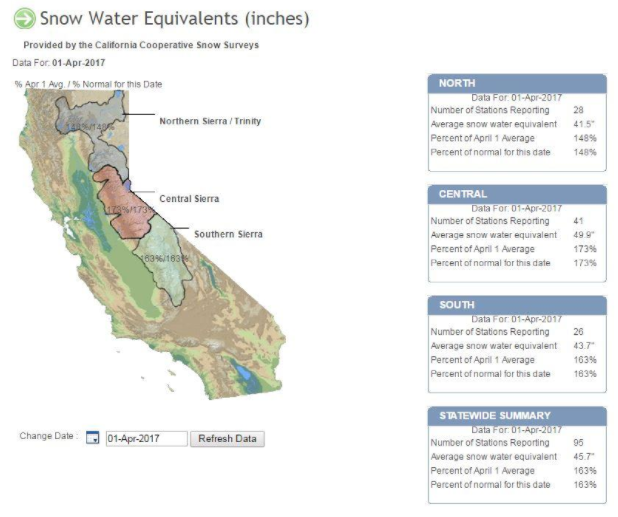 With the statewide average at 163% of normal seasonal snowfall, it was the snowiest winter they have seen in this drought-stricken part of the nation in decades. In fact, at Mammoth Mt. ski resort, seasonal snowfall exceeded 500” this year making it one of the snowiest season’s on record. 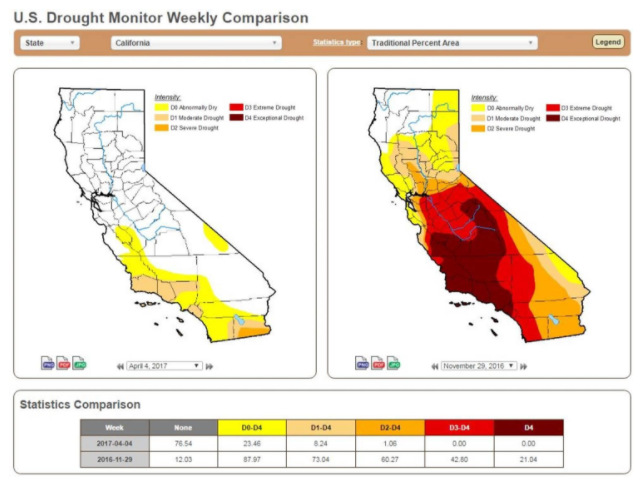 A comparison of the drought conditions for California from November 29th, 2016 to April 4th, 2017 shows just how much of that drought has been erased. Recently researchers have developed an index to rank the severity of the winter at locations around the U.S. The Accumulated Winter Season Severity Index (AWSSI) was developed to objectively quantify and describe the relative severity of the winter season (Boustead et. al 2015). AWSSI uses a set of parameters to that are readily available throughout the U.S. observation network. The severity of a winter is assessed through the intensity and persistence of cold weather, the frequency and amount of snow, and the amount and persistence of snow on the ground. 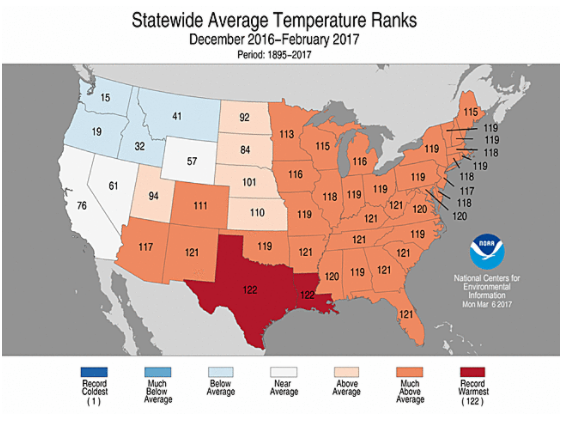 It will come as no surprise then that the map of the U.S. might be similar to the average temperature rankings across the U.S. this past winter. As shown in the figure below, where it was coldest, in the Pacific Northwest through Northern Rockies, the winter was most ranked as “Severe to Extreme”. On the flip side, almost everywhere east of the Rockies was considered for the most part “Mild”. 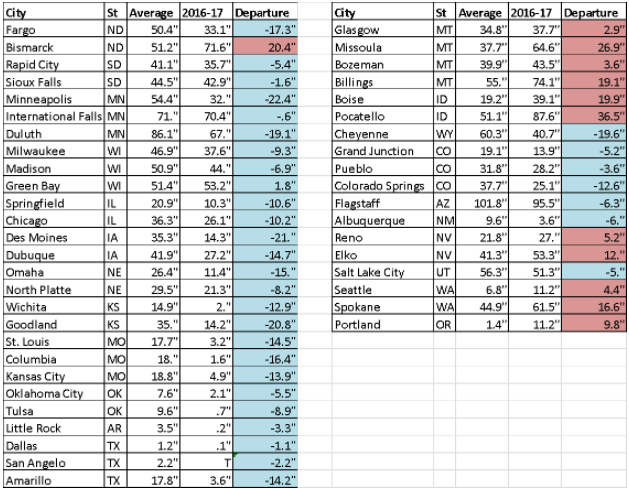 To illustrate a bit further I compare two cities below, Spokane, WA (Extreme) and Washington, DC (Mild). In Spokane, the temperature was well below normal for the winter season and the snowfall was well above normal. As a result, they also had a tremendous number of days with snow on the ground. AWSSI combined all of those factors to rate Spokane Extreme. 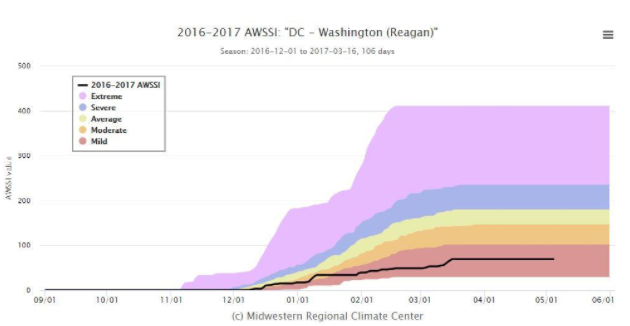 However, Washington DC barely got a taste of winter this year with very little in the way of cold temperatures, snow fall and of course days of snow on the ground. So, their AWSSI chart looks VERY Mild. 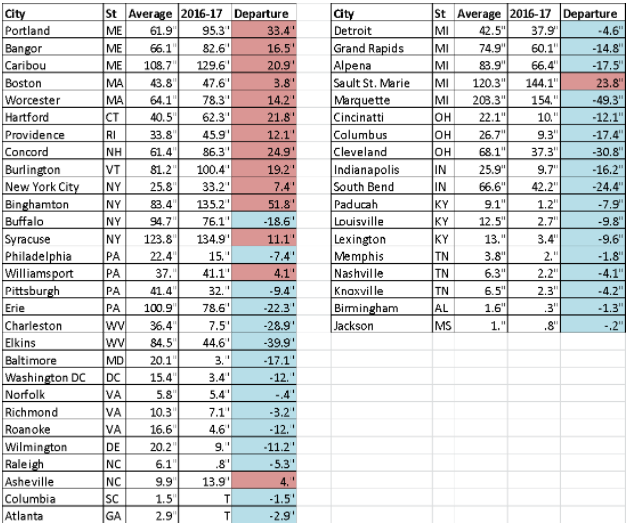 Along with a map of the statewide temperature departures across the nation during the meteorological winter of 2016-17 I also have tabulated the snowfall for several cities. Note, the departure from average snowfall is color-coded so that blue is below normal and red above normal. Cities are loosely grouped from East to West across the U.S. Even from this set of tables you can see some pattern to the snowfall, New England for the most part had above normal snowfall, much of that came from the two major winter storms of the season, Argos and Stella. The West meanwhile had mainly above normal snowfall due to a colder and wet winter. Much of the rest of the nation however, had below normal snowfall. The snowfall departures match fairly well with the AWSSI map of the U.S. as well. The cold West was conducive to a LOT of snow and major snowstorms. It was no surprise then that many of our named storms had their beginnings out in the West. 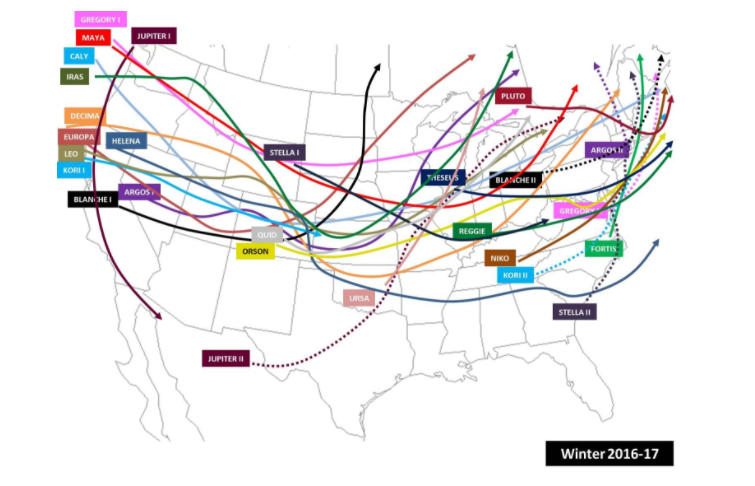 The storm tracks for this past season are shown below. Even with a very warm winter for much of the U.S. there were still enough Lows that tracked through cold air to develop some very impactful storms. It is tough to detect any type of pattern or preference to storm tracks looking at the season as a whole. However, compared to previous years, this season saw many storms with long, west to east, trans-continental tracks and there looked to be a subset of “second Phase” storms (dotted line tracks) that developed from the Midwest through Tennessee Valley and Mid-Atlantic including a couple whopper Nor’easters, namely Argos and Stella. 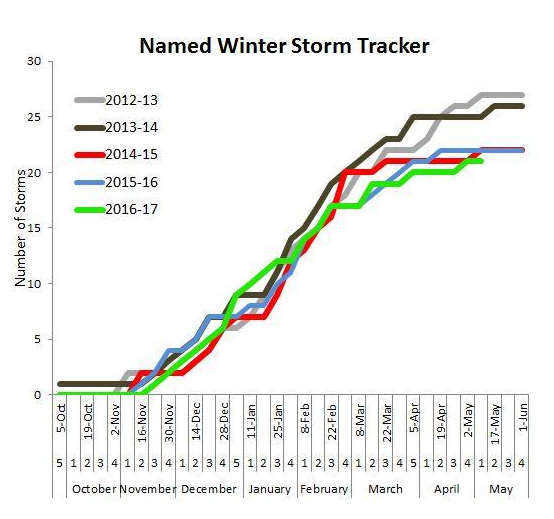 Each year I am surprised at how consistent the pace of naming winter storms is throughout the season. This past season was no exception. With only a small data set in mind (5 seasons), you can readily see how the bigger impact storms start up in November for the most part, then there seems to be a break in the action somewhere in the second half of December through mid-January before really cranking up in February. Winter finally winds down in late March but once again this season, we had a named storm that spanned a timeframe into early May!! I would be remiss if I did not mention the fact that after another mild meteorological winter, parts of the Northeast underwent a very cold March and as a result a late dose of wintry weather. 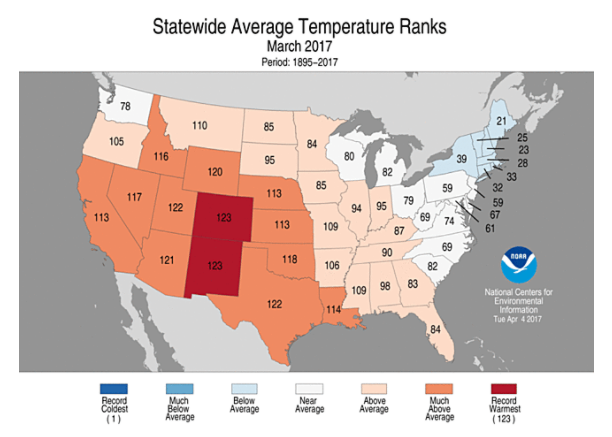 To illustrate this, below are the March temperature rankings across the U.S. by state to show just how cold it was in the Northeast. As a result of that cold period, we had a few Lows that tracked through that cold air and as a result, spun up some big storms. Places like Binghamton, NY played host to their greatest storm total snowfall on record when 35.3” was recorded March 14-15 during Winter Storm Stella. For comparison, they received 32” of snow the entire previous winter. This storm eclipsed the record snowfall for a storm that was set just 4 months earlier, back in November 19-22 when 27.6” occurred in Winter Storm Argos. 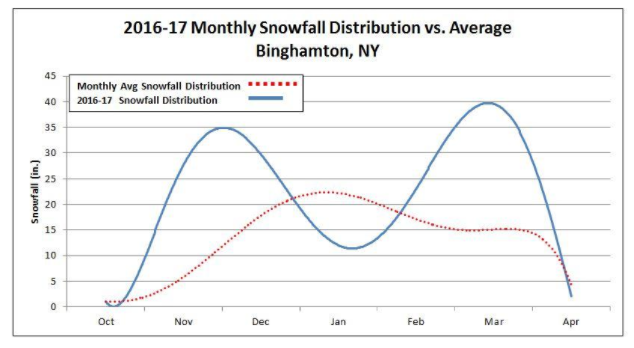 The chart below compares the normalized distribution of monthly snowfall for Binghamton to what occurred this season. 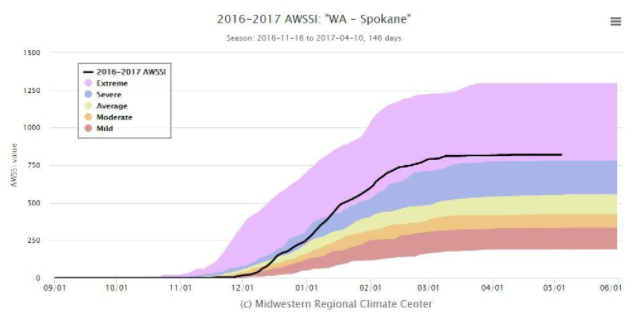 The typically snowiest part of the winter was almost snow-free, whereas those “bookend” storms skewed the monthly totals way above the average snowfall. Hopefully, this summary gives everyone a feel for what the “flavor” of the 2016-17 winter was like. In Part II of this summary I will show the track and snowfall footprint associated with each named storm this winter, along with some brief highlights for each storm. Enjoy! Get to Part II of the 2016-2017 Winter Storm Summary here. Dr. Niziol, I look forward to this all winter. Thank you for compiling all this data and sharing it with us. Louisiana, from below average to above average to record warmest, it really is my dream come true. If only the cause was benign.